V. Surikov is considered a clairvoyant, he depicted his knowledge on a canvas. The artist was not like anyone, his career was interrupted for a long time. The work “Healing the Blindborn” was the first picture after a long break. In this work, he conveyed all his state of mind. The painter claimed that the canvas created for himself, having splashed out emotions, he tried to heal after a heavy loss of his wife. 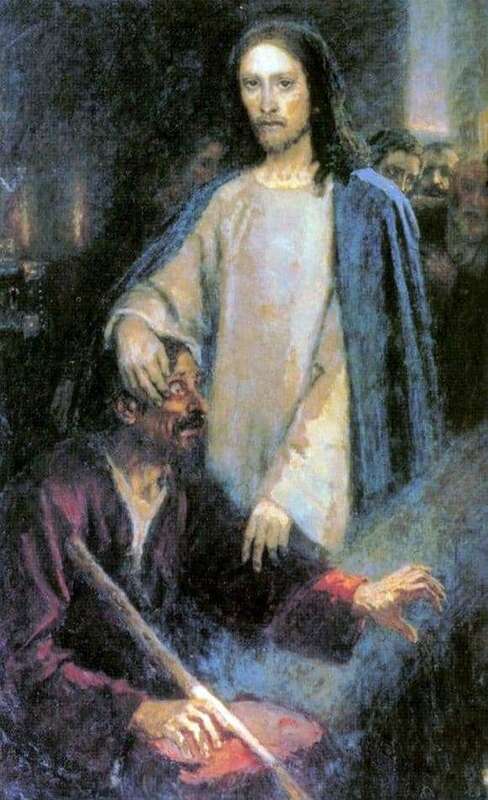 The painting depicts Jesus healing a blind man. Over the shoulder of the prophet are the faces of the curious, you can make out the surprise on their faces. Christ appeared as a classic for the biblical story, but his face is very similar to the Slavic type. Blind in disarray, his face shows a whole range of emotions. His fingers are bent, as if he is looking for a cane or a support, because his eyes do not see anything. Jesus expresses calm, with one hand he holds the hand of the sick, and the other he places on his head. All become his expresses harmony and confidence. Blind on the contrary, beating in agony, he is lost and completely uncertain, he does not believe in a miracle, despite the desire to see the light. The painter in the image of the blind person embodied himself, namely his condition. He could not come to his senses for a very long time and return to life. In the face of Jesus, the artist’s creativity comes out; he is healed by art. The picture inspires faith in life and endless hope. The painter set the work not immediately, he created it for himself, healing his soul. The master realized his blindness and helplessness. He had to return to life, healing was not easy for him, it was necessary to release all the demons and accept the help of the prophet. The surprise on the faces of those present was copied from real people. At first, everyone was struck by such a long mourning, and then the return to life was alarmed by many of the wizard’s friends. Nevertheless, the master revived himself.